Ask Willie Stylez - The Blog! 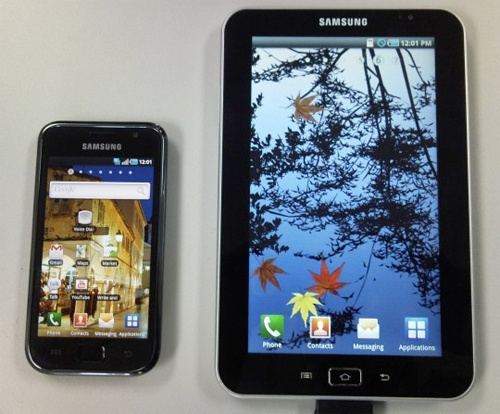 : WILLIE STYLEZ TECH REVIEW: Samsung Galaxy Tab Tablet To Come In 7, 8 and 10-Inch Models? WILLIE STYLEZ TECH REVIEW: Samsung Galaxy Tab Tablet To Come In 7, 8 and 10-Inch Models? Samsung Galaxy Tab Tablet To Come In 7, 8 and 10-Inch Models? What difference does an inch make? If you ask Samsung, quite a bit apparently. The leaked 7-inch Galaxy Tab tablet will be joined by an 8-inch and 10-inch model several months after the August launch pitted for the 7-inch Android. They'll go on sale first in South Korea in December, according to the Korea Herald, and will then be rolled out worldwide after that—presumably if the reception is favorable. I am thinking that the 8" model is going to be more of a Premium counterpart to the 7", then the 10" will be their answer to the iPad. One of the comments on this posting mentioned, both 7 & 8 will be just as portable as any other large smartphone, but we all know that 9.7, 10 and 11.6 inch tablet/slates are not pocket friendly AT ALL! One of the other commentors didn't like the fact that another 16:9 tablet was being released. I am not sure if he realizes that 16:9 everything (monitors, TVs, slates, laptops, etc) are all made because the "general public" is stuck on the widescreen (silver screen induced) craze! If someone released a square display on anything, talk about FLOP, it would be have RECORD lows in sales numbers because we are all now acclimated to wanting wide! Anyway, we will see how it fares in Korea and see if we can get our hands on one here in The States!